Find the Heart for one lucky leader. 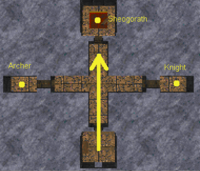 Talk to Nulfaga at Castle Shedungent and be teleported to Aetherius. Navigate through the puzzles of the Mantellan Crux. Find and retrieve the Mantella. Speak to Nulfaga again to watch history unfold as you have made it. This is the final quest and the end of the main storyline. After you gave the Totem of Tiber Septim to someone of royal blood, Nulfaga contacted you in a vision asking you to visit her at Castle Shedungent. Only Nulfaga can transport you to the realm of Aetherius, where the Mantella is hidden. I do not know who of these seven is most worthy of the Power, for too long have I let my passions make me mad. Sometimes the fate of a world hang [sic] on the decision of one person. You have choosen [sic] who will command great Numidium. You bear the burden for the consequences. I send you now to the Mantellan Crux, the safeguarded prison of the Mantella. Look for a green jewel of unusual size. Merely touch the Mantella and it is freed. You will be transported back to my side." She will immediately send you to the Mantellan Crux. You enter the Mantellan Crux at the Three Floating Islands. Once your vision clears after being teleported, you find yourself on a floating island in the middle of nowhere. Next to you is an ugly bust, apparently of a demon. East of your current location is a Daedra Seducer standing on a path constructed of tiny floating platforms, so dispose of her if you want. Right above you is another floating island; levitate up to this island. If you haven't come with a Levitate spell of your own, touch the demon bust and it will cast Levitate on you. Once you reach the tiny island, pull the lever there and float down below the island where you entered the Mantellan Crux. Below this island is another floating island containing four blank doors and one or two Frost Daedra. Once you have landed, dispose of the Frost Daedra and close the south door. Don't concern yourself with the other three doors; you don't need them, and some of them will even injure you very badly if you interact with them. On the east side of this island is a small cavern, right below the surface. Levitate down and pull the lever within. 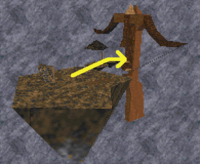 Once this lever has been pulled, float back up to the middle island containing the demon bust. 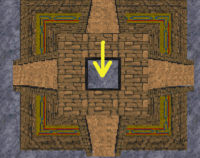 If the Levitate spell wears off, touch the bust again and fly up until you are right below the ceiling of the giant room in which the islands are floating. There is an open doorway in the southwest corner; fly into it, walk a short distance to the east, then fly or climb up the shaft. Once you are up, follow the hallway until it turns north. 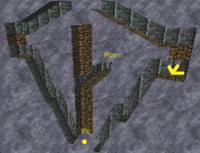 When you come to the four-way intersection, keep going north (the west hallway dead-ends at a room with two enemies and a treasure pile, while the east hallway leads to another room containing only a treasure pile). When you follow the hallway further north and up a ramp, you will encounter a vampire; destroy her and follow the hallway further up. You will eventually come across a force field blocking your way to the west. Behind it is a Daedra Seducer, kill her from behind the force field since she cannot come near you. 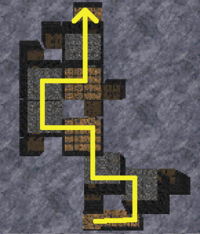 Follow the hallway further south and you will come to a lever guarded by an enemy. Kill it and pull this first lever, this will lower the force field. Go past the vanished force field and pull lever 3. This will lower a second force field right in front of you. Pull lever 4 and follow the hallway. Don't pull lever 2 or it will raise a force field further down the hallway. Continue following the hallway until it turns north. 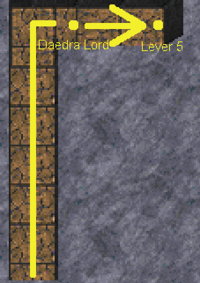 At the end of the hallway you will encounter an enemy, often a Daedra Lord. After you have disposed of it, pull lever 5. Backtrack all the way to the middle floating island, where you first entered the Mantellan Crux. From the demon bust, follow the path of tiny floating platforms. Dispose of the Daedra Seducer if you haven't done this already. Below the surface of the island is a small cavern containing a Daedra Lord. If you didn't kill him when the force field was active, destroy him now. Once he is taken care of, step onto the red carpet and you will be teleported to the next section of the Mantellan Crux, the Great Pyramid. From the point you were teleported to from the last section, go west and through the door. You are just in front of the Great Pyramid, but you can't see it because you are looking directly at the rim of the giant rock it is constructed on. Take the elevator-platform down. Here lies the spirit of Benefactor, though his body still guards the way. Just take note of the name "Benefactor" for now. If you click gravestone 4 you will hear a groaning sound. This gravestone opens one of the trapdoors inside the Great Pyramid. Clicking gravestone 1 will also produce a groaning sound. Once you have clicked gravestone 1, levitate down the graveyard-island. There is a cavern in the side of the island, inside is a lever. Clicking gravestone 1 has lowered the force field which previously blocked the entrance to this cavern. Pull the lever inside, this will open the second trapdoor at the bottom level of the pyramid. To proceed further, you must reach elevator-platform 3. If you can't levitate, ride elevator-platform 2 down. The lever is at the entrance of the island's cavern. Follow the path of floating platforms and take care of the lich along the way. Once you have reached elevator-platform 3, ride it up to the very top. "I guard the Way. Speak only my name, and I shall grant you passage." Type "benefactor" and he will be content and open the trapdoor at the very top of the Great Pyramid. 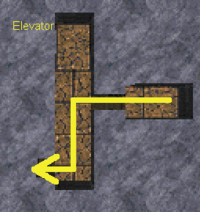 Now that all trapdoors have been opened, fly down to the pyramid and take the first elevator down. On the first lower level you will encounter a pair of enemies. Take care of them and ride the second elevator down. Jump down the shaft on this level, but be careful since there is a Daedra Lord in the room. 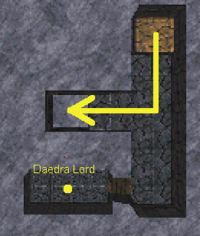 At the bottom level of the pyramid you will encounter a Daedra Seducer near the third trapdoor. If you didn't open this last trapdoor you may get trapped inside the pyramid if you lack a Levitate spell or haven't set a Recall anchor somewhere outside. 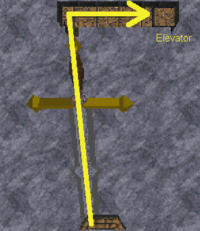 You cannot climb back up the shaft because there are no walls nearby. Jump through the open trapdoor to reach the next section of the Mantellan Crux. Leave the room you were teleported to and go through the doorway. There is an elevator at the opposite side of the hallway, but more about this later. Once again, you are in an open space. In the center is a shrine-like building under a rock dome. Follow the path down to the shrine, or alternatively step onto platform 1 and it will take you down. However, if you step on platform 2 it will go down to the very bottom of this section. Once you are in front of the shrine, you will notice that it is turned upside down. The south door is magically locked. To unlock it, open the east door and pull the lever inside. Then go to the west door and the crate that was previously there will be gone, revealing another lever. Pull this lever to unlock the south door. Use the tiny floating platforms to move around the shrine. 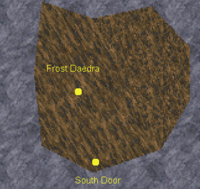 Behind the north door is a Frost Daedra, but you don't need to concern yourself with it. The now open south door reveals a blue obelisk, touch it and it will teleport you to the next section of the Mantellan Crux. If you have an Open spell, you can skip pulling the levers and open the south door with your magic. If you want to explore this section more thoroughly, you can take the elevator near the point where you started and go down. After a long ride, you will come to a hallway with a Skeletal Warrior and a Daedra Seducer. There are two doors in this hallway. One leads to a room with three treasure piles, the second leads to a catwalk below the shrine. There are two elevator platforms there. One takes you up to the shrine the other down to the very bottom of this section. At the bottom are three Sabertooth Tigers and a Fire Atronach, but nothing you should worry about. 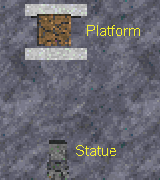 A conspicuous platform is also at the ground, north of a marble statue. If you step on the platform, it will take you up to the catwalk below the shrine where you can use the elevator platform to go up to the shrine. You will find yourself in a room with eight doors. There are some enemies behind the doors: two vampires, a Daedra Seducer, and a Harpy, take care of them. The second door to the west is a vicious trap, if you touch the door, you will be teleported into a cage in the opposite room. This cage will be lowered into a room of Orc soldiers. If the cage reaches the bottom, it will go up again. Even if you managed to kill the orcs that attack you, you cannot get out of the cage; you will be trapped inside unless you have set a Recall anchor outside or cast a Levitate spell as long as the cage is sinking down. Doing so will stop your downward movement and the cage will go down until you are outside again. The only way out of the room is through the southeast door. Go down the hallway; a Daedra Seducer will be waiting at the first intersection. 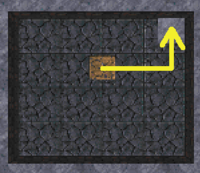 At the second intersection turn west, go through the door and right through the other door in the hallway. The room to the east is where the cage is lowered. 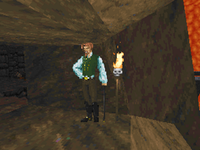 There are three orc soldiers in the room and a fourth stands at the north doorway, some bones and body parts are scattered inside this room as well. Hear me: The Blind God is a jealous god. Let His true servants lift up their eyes unto Him, and the Way will be easy. Hear me! The skull's words are a clue; the "servants" are the other small skulls in the room. You must find and touch all skulls that face the giant skull in the center, the Blind God. The first of these skulls is just near skull 1, the skull that gave you the clue. Walk past it and up the catwalk, touch skull 2 and it will start to rotate. Kill the Fire Atronach along the way. Walk back to the junction near skull 1 and follow the catwalk up. Walk past two skulls (which are not visible on the screenshot) and touch the third skull you come across (skull 3), it will also start to rotate. The other skulls in this room will also start to rotate if you touch them, but either they will do nothing, cast a harmful spell on you, or will teleport you around the area. One of the skulls creates a second force field in the eyes. Worst-case scenario, you will be teleported to the top off the Blind God but in mid-air. Without a Levitate or Slowfalling spell this might cause your death. Make your way to the top of this room; a Levitate spell will make this easy. If you walk on the catwalk, be careful as there are numerous Fire Atronachs that might knock you off. "Ah, at last! I was beginning to think you wouldn't get this far. A dreary place, don't you agree? And guarded by a pompous upstart -- he's no more a god than I am. Well, carry on. We will meet again soon, unless you are not as foolhardy as you appear." Again, this refers to the skulls in the fire room. Only one skull faces away from the Blind God, so type "1". After giving the correct answer you will be teleported to the next section of the Mantellan Crux. Touch either skull 6 or 8, or alternatively you can cast an Open spell to unlock the door. 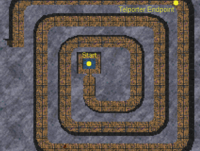 Walk through the spiral hallway and kill all the Atronachs along the way. There are eight Atronachs in total, five Iron and three Flesh Atronachs. If you teleport, you can avoid most of them. Go through the door at the end of the hallway. Climb up the stairs and go up the hallway. You will pass three armor suits along the way and you will also encounter a humanoid foe, an Archer. Go through the door at the top of the hallway. Behind the door waits a Knight, so kill him since you cannot bypass him. 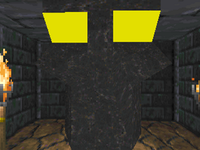 You are now in a somewhat confusing construction, but if you explore it a bit and look at it on the 3D Map, you will recognize it has the shape of a crossbow. There is apparently nothing interesting in the "crossbow", only an empty room. Go to the bottom of the "crossbow" where a pit is located. There is another Knight on the other side of the pit; kill him or he will shoot arrows at you. Afterwards, jump into the pit. A familiar voice laughs mockingly, "So, (player's name), come to pay your respects properly at last? You will be teleported into the empty room inside the "crossbow". "Greetings, (player's name). You dare much by intruding here. Nevertheless, I will allow you to proceed, provided you prove as perceptive as rumor reports. You may be aware that I am a master of the blade. But what is my other favored weapon? Answer correctly, then arm yourself." Type "crossbow" and Sheogorath will be content. Go back again to the "crossbow" and jump into the pit at the bottom to be teleported to the island with the giant sword. Note: You can go directly to Sheogorath when you enter the "crossbow", it is not necessary to use the platform between the two balconies at the island at first. Back at the island with the sword you will notice an open trapdoor, go down the ramp. Touch the left red "thing" and the stone box will open, touching the right "thing" will cast a harmful spell on you. Touch the smaller box inside and it will also open, revealing a white button. Press this button and the whole island will sink down. On the way down, there will be more Daedra Lords in tiny balconies; seek cover from their spells if you don't have a Spell Reflection spell. The island will sink down to a gigantic crossbow. 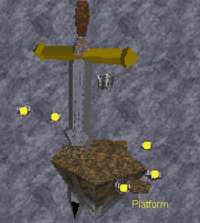 Use the platforms to reach the crossbow and step into its notch. Turn around and touch the left halberd. You will be shot up to a mark and the gigantic sword will tilt over. 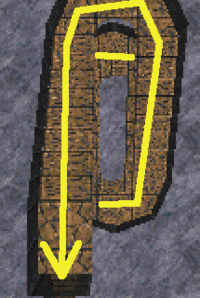 Use the sword as a ramp to reach a door at its pommel. Go through the door and take the elevator down to reach the final section of the Mantellan Crux. This last section is pretty straightforward. Just make your way through the rooms and destroy any ghosts and Fire Daedra you come across. Every room has a small closet but there is only one door leading to the next room. Once you are in the last room, step out into the hallway. Follow the hallway and jump or levitate over the pits; in the last pit is a Vampire Ancient, dispose of him if you like. At the end of the hallway you will reach a gateway leading into a gigantic room that houses a shrine-like building. There are no paths leading to this shrine, but the lantern at the end of the hallway will cast a Levitate spell on you if you touch it. Make your way over to the shrine and in its center you will find the object you have come for, a green gem—the Mantella. Touch it to release the heart of Great Numidium and see how your decisions in the previous quest take effect. "Not so fast (player's name). Don't you want to see the result of your handiwork? Look now into the Book of the Time. Read upon its pages the history of what shall pass within the next few days. Read fate as it shall be recorded upon the Elder Scrolls." The winning animation for the holder of the Totem will play. Numidium rises to do the bidding of its new master. For all winners except the King of Worms, the Underking flies out of his crypt to reclaim his lost heart. This grants him the death that he has so desperately sought. It also destroys the great Numidium. The holder of the Totem does get to use Numidium long enough to achieve incredible power. Akorithi, Eadwyre, Gortwog and Gothryd use the power of Numidium to crush the other powers of the Illiac Bay thus making their own realms the dominant power within the region. 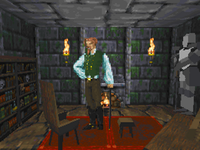 Daggerfall: "Great Numidium comes to the call of the dragon of Daggerfall. The armies of Sentinel and Wayrest fall like scattered leaves, letting Daggerfall secure control of the Illiac Bay." Orsinium: "Under the command of Gortwog, Numidium destroys the other powers of the Illiac Bay; Daggerfall, Sentinel, and Wayrest. A new Orcish homeland is carved out in Orsinium, and the Empire will never be able to dispute Gortwog's claim to Orcish equality." Sentinel: "The Mantella is released from Aetherius and at the command of Sentinel draws forth great Numidium. The other powers of the Illiac Bay are swept aside like children's toys, placing the right rule of Sentinel in ascendancy over the Illiac Bay." Wayrest: "King Eadwyre of Wayrest, traitor to the Empire, commands great Numidium to destroy his enemies. Daggerfall and Sentinel fall first, leaving Wayrest in complete control of the Illiac Bay." The King of Worms uses the Mantella to make himself into a god. "The Mantella is hurled from Aetherius, and although drawn to the empty chest of great Numidium, the will of the King of Worms commands it to his side. With this power, the King of Worms leaves his mortal frame and joins the ranks of the gods of Oblivion." The Underking reclaims his lost heart, thus giving him the death he wished for. "Centuries of undead sleep are shaken off, rousing the Underking. No mortal force can stop his fateful reunion with the ghost of his heart, and he joins with it in an all-consuming fiery embrace, and for just one moment, he is flesh and blood, a blessed death is granted to Tiber Septim's battlemage." The emperor uses Numidium to crush the armies of the rebelling kingdoms, restoring order to the Empire of Tamriel once again. "Great Numidium, its raw power tempered only by The Blades, crushes all the rebellious children of the Empire, destroying their armies." "Your work is done (player's name). The world is no longer as it once was. Such is the way of things. Oh, and if you tell my lich statue to shut up, the door to my chamber will open." The Mantellan Crux itself is defined as a Harpy Nest. 0 (Date): Nulfaga has sent me to the Mantellan Crux to find the Mantella, the heart of the great Numidium. It is supposed to be a big, green gem. All I have to do is touch it.